This necklace takes the natural beauty of honeycomb and turns it into a lustrous work of wearable art. 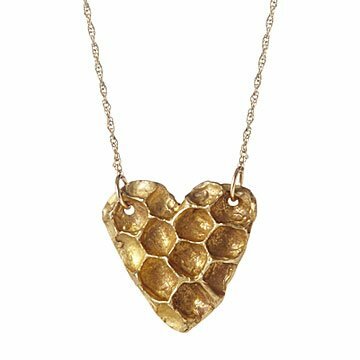 When a beekeeper friend gave Nancy Nelson some extra fragments of honeycomb, her creative eye was drawn to one heart-shaped piece. Noting its delicate beauty, she cast the naturally geometric finding in brass to preserve its subtle grooves and perfectly imperfect silhouette. The design serves as a tribute to bees" own awe-inspiring design skills and vital role in our environment. Suspended from a delicate, gold-plated chain, this eye-catching pendant is an attractive token for bee and nature-lovers alike. Handmade in Maryland. Make it a set! Click here to see the matching Bee Love Earrings and Bee Love Bracelet. Read about Nancy Nelson's passion for honeybees and the honeycombs they create on our blog. Her passion for working with metals emerged while obtaining her BFA in industrial design. After enrolling in a metalsmithing class where she made her first sterling silver ring, she was hooked and continued developing her own unique style. Modern shapes and rustic forms reflect her belief that jewelry should evoke an emotion and tell a story for every wearer. Read about artist Nancy Nelson's passion for honeybees and the honeycombs they create on our blog. Clean with a polish cloth and keep in an air tight bag when not wearing. I have been waiting for a replacement for two weeks. I am very unhappy with the customer service I have gotten. My gift was shipped and when it arrived the link was broken. This was fine because I was told I can return it and they would ship me a new one as soon as they saw the product was being shipped back in the system. They ended up refunding me my shipping because i had seen another comment from someone else who had to get a replacement and you guys offered to refund the shipping, so i asked for the same. When I finally sent out the 11th, I didn't expect it to take more than a few days to get a new one. The 16th came around and I emailed customer service again asking about the shipment and was told it was arriving to the warehouse that day and would be processed. I heard nothing and emailed them again today the 23rd and was told I am not getting a replacement and was issued a refund???? Girlfriend turned it backwards as the honeycomb were better shaped and cleaner on the back. "Mom, this in my new fav!" I was amazed. So cute. Incredible quality for a low price. A big hit with my daughter-Art teacher & environmentally conscious 26 yr old. Gave this to my wife for Christmas. She loves it and gets compliments all the time. Although, after a couple days of rubbing against the skin, it does lose luster and turn a grayish color. Instructions on how to clean it would've been nice but I can just google that. Overall, love the piece. Photos dont do justice to the piece! I thought it was small, but turned out to be a good size! This is a stunning piece, and absolutely perfect for my partner (who I call "Bee")! Just as i had expected. Gorgeous! The packaging was so impressive and unique.